ARC Super Trick Factory Replacement Slipper Clamp with CNC’d Hot Start Lever. 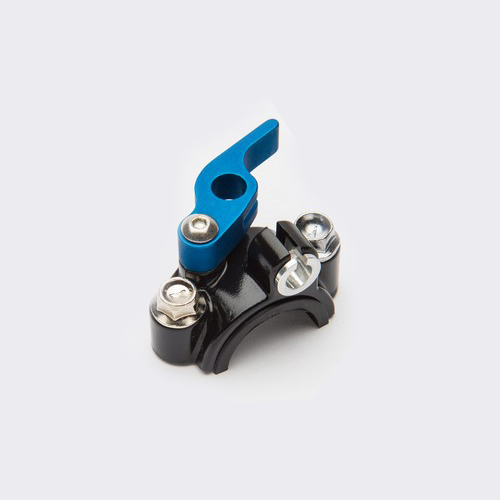 HS-201 HOTSTART CLAMP: This hotstart clamp fits most clutch perches and brake master cylinders. A thin nylon sleeve reduces the drag on the handlebar allowing the control to move in a crash. It is supplied with matching "A" (for ARC) bolts, one having a blue locking agent on the threads. The top bolt is to be tightened and the lower bolt with the locking agent is snugged just enough to keep the control from rotating easily. It can also be used on the right side with a Brembo brake.